A grain is the small, hard, dried seed (or fruit – but really it’s part seed and part fruit) from the grass family. 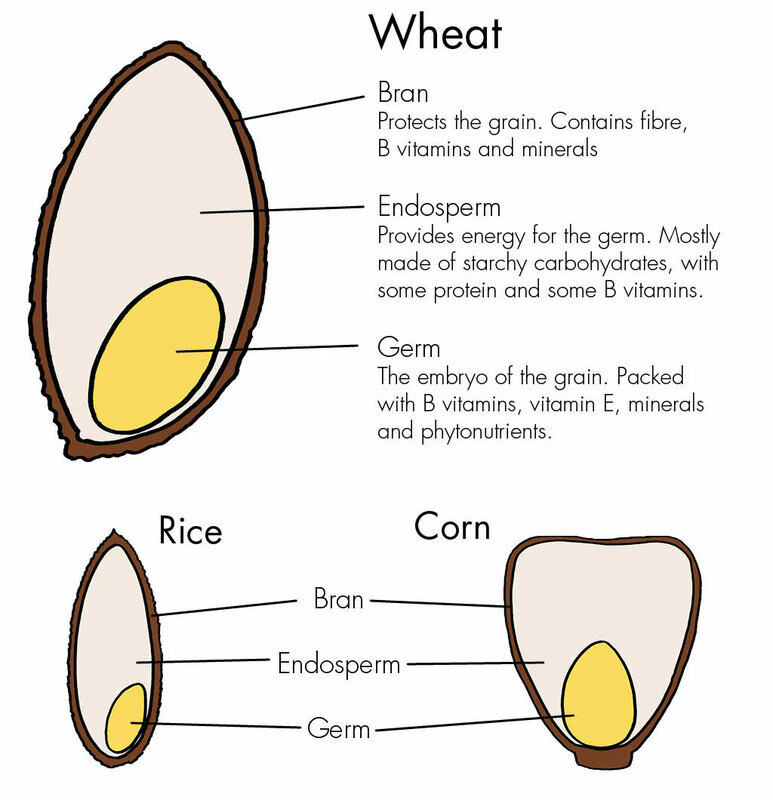 There are 3 parts to a grain; the bran, the germ and the endosperm. The bran is the hard outer shell and holds the most fibre, B vitamins and minerals. The germ is the embryo and has potential to sprout into a new plant. 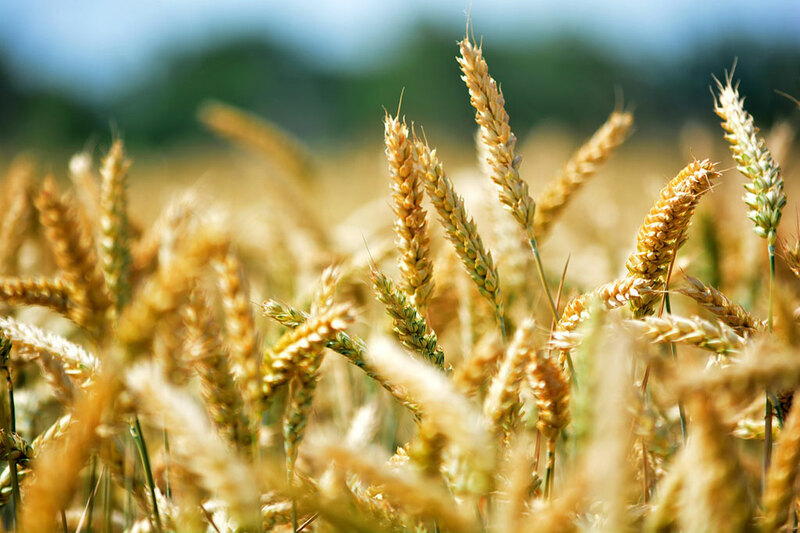 This part of the grain is packed with nutrients including essential fatty acids and vitamin E. The large soft center of a grain is called the endosperm, and mostly contains starchy carbohydrates and some protein, which is the germ’s food supply. It is thought that prehistoric man may have been eating grains as long as 100,000 years ago, but grains really burst onto the scene with the Agricultural Revolution over 12,000 years ago. The Agricultural Revolution was the shift for many human cultures from a lifestyle of hunting and gathering to one of agriculture and settlement. This was a worldwide trend that followed the last ice age. The climate became a lot hotter which meant longer and drier seasons. Humans then became aware of plant life cycles and understood how seeds worked, and began growing wild grains and legumes. With a steep rise in the world’s population, agriculture supported more people than hunting gathering did. The abundance of food in the form of dry wild grains and legumes that could be stored lead to the hunter gatherers forming settled villages for the first time. 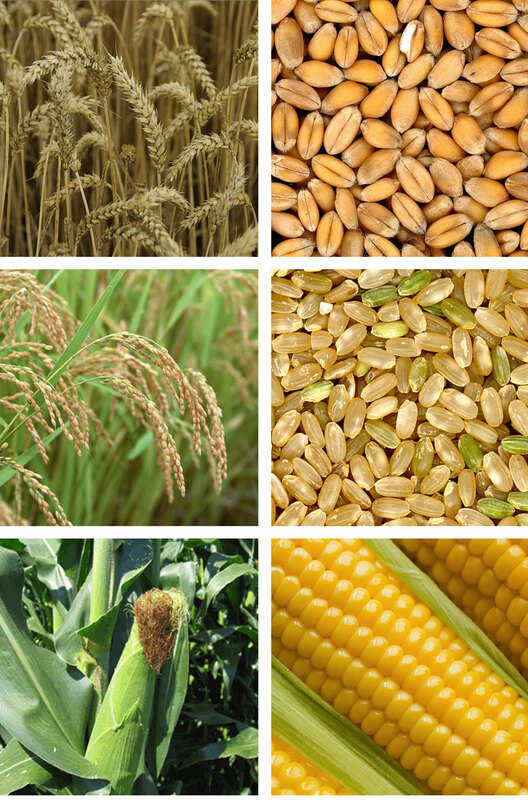 Different types of grains developed separately, over centuries, in different parts of the world. The fertile crescent of the Middle East and ancient Egypt birthed wheat and barley, Central America produced maize (or corn) and China cultivated rice. These 3 grains are responsible for feeding most of the world’s population with their fibre, nutrients and protein. From top to bottom: wheat, rice and corn. When you eat a whole grain, it contains the bran, germ, and endosperm – so you get all of the nutrients that the whole grain has to offer. If you eat a refined grain, it contains only the endosperm (the starchy middle part) so you miss out on a lot of the vitamins, minerals and fibre. Refined grains have been processed and polished to have its bran and germ removed leaving only the bright, white starchy endosperm. This is done to give grains a finer texture and improve their shelf life, but it also removes dietary fiber, iron, and many B vitamins. In some refined grains, B vitamins (thiamin, riboflavin, niacin, folic acid) and iron are added back after processing. The fibre, however, is not added back. Examples of refined grains are white flour and white rice. And further processing would produce white bread, pasta, tortillas and some breakfast cereals. Because whole grains contain the entire grain, they are much more nutritious than refined grains. Whole grains, along with their fibre, have a unique phytonutrient composition that can survive digestion and reach the colon. This may help explain why eating grains has been associated with lower colon cancer rates. A great whole grain is quinoa (keen-wah). It looks much like couscous, but infact quinoa is a seed that are much more nutritious. Packed with fiber, iron, magnesium, and manganese, quinoa is a great substitute for rice, it is also a complete protein which is great news for vegetarians. Quinoa also gluten-free! Gluten is a mixture of two proteins found in the endosperm (starchy centre) of wheat, rye and barley (but not corn or rice). It acts as a glue that holds the food together and is responsible for maintaining the grain’s shape, for the elasticity of dough, and the chewy texture of bread. In latin, “gluten” translates directly to “glue”. Gluten has been in the human diet for centuries and it isn’t necessarily bad for you. Some people are gluten-intolerant, meaning when the gluten reaches their digestive tract, their body’s immune system mistakes the gluten for a foreign invader (like bacteria) and launches an attack on it. The resulting inflammatory response can cause abdominal pain, bloating and heartburn. However, about 1 in 100 people suffer from a condition known as celiac disease, which is not an intolerance but an autoimmune disease. In this case the immune system fiercely attacks both the gluten as well as the intestinal wall itself. This causes damage and degeneration of the intestines, which leads to nutrient deficiencies, various digestive issues, anemia, fatigue, infertility, osteoporosis, bowel cancer as well as an increased risk of many serious diseases. There is no known cure and the best treatment is to follow a life-long gluten-free diet. But millions of people who don’t have coeliac disease still experience negative symptoms after eating food with gluten in it. This can be a result of how the gluten has been processed and refined. The composition of the gluten changes making it more gluey and even harder to digest. However, unless a person has coeliac disease, it is unlikely they will need to lead a completely gluten-free lifestyle and may benefit from simply cutting down on the amount of gluten containing food they eat. The best way to test yourself is to stop all gluten for a few weeks, and then gradually reintroducing it into your diet, assessing your body’s response. This is a good way to determine your own gluten threshold.